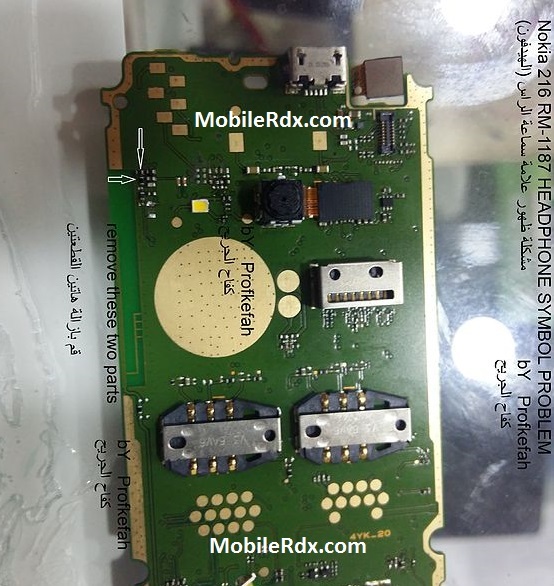 Here’s the solution for Nokia 216 RM-1187 in fixing Headphone symbol problem. If something went wrong like if there is no sounds can be heard if the handsfree or loudspeaker is being activated, this solution might help for your repair. The distorted sound in earphones. The unbalanced sound of earphones. The problem might be in the Audio Jack on your phone, you might need to replace Audio Jack. Check with any other working headset in order to verify the actual cause of a problem. Clean Audio jack contacts with the help of a cotton cloth and check. If the above mentioned steps fail then replace your Audio jack with a new / working one. Nokia 216 Headphone Mode Activated, Headphone Ways, Jumper, Handsfree Solution, Handsfree Ways, Not Working Problem.